In 2007, an LX Touring party visited Padua, and befriended a Viennese (younger) side who were short in numbers and grateful for some LX player assistance. As a result, and as had been promised, LX were invited to participate in a weekend tournament in Vienna in early July 2008 an invitation readily accepted on behalf of LX by Richard Clarke, who acted as Tour Manager. Vienna is actually a small city, and most things to see and do are in the heart of the old stadt and within easy walking. The city is also served by an efficient and inexpensive tram system, which we used to access the National Hockey Stadium on the perimeter of the old city. The Stadium boasts a new water based pitch, Vienna HC have a nice Clubhouse at the pitch, and the veterans tournament coincided with an International Ladies under 21 Tournament. So the weekend augured well! Despite threats of rain and storms, the entire weekend of Friday to Sunday proved hot and sunny, making our games of 25 minutes each way more than sufficient. The clubhouse had a large terrace, and copious supplies of beer and wine were enjoyed after the matches, along with a range of dishes from the clubhouse kitchen. On the Friday, LX played Vienna HC and lost 3-0 and a Croation Club losing 6-0. In both cases the opposition were considerably younger and also skilful, so the results were not considered negatively. 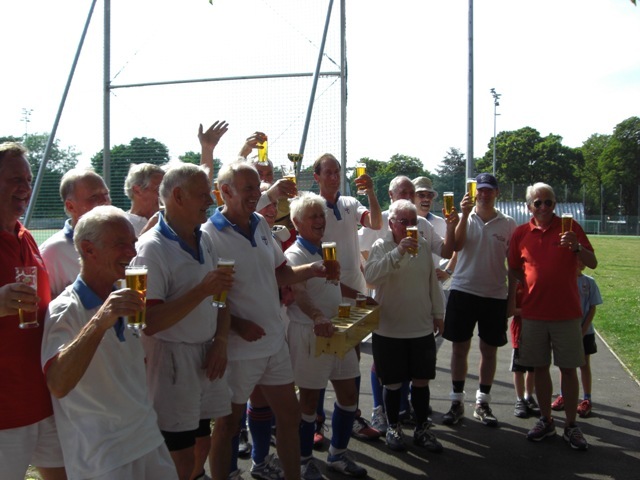 Saturday we drew with the Vienna All Stars (who had some ladies in the side, balancing the age advantage) and Sunday we beat the same side 2-1. All the games were very enjoyable and played in excellent spirit. Memorably, only David Brampton could hit the cross bar when only 6 inches from the goal line, Alan Dures - who had plenty of work in goal was outstanding, and John Land, on being advised in one match by several LXers to square the ball to nearby Nigel Spencer-Knott, paused frustratedly with the memorable words Okay, Ive got the message, but where is Nigel??!. Our hosts laid on a BBQ on Saturday night along with a typical Austrian band and to our credit, LX danced the evening away! As we had played on the Saturday morning, we took a river trip in the afternoon, then a caf頢reak followed by a ride on the famous (The Third Man) Ferris Wheel where Richard had reserved for the LX group 2 cabins and champagne in celebration of his 65th birthday at the end of which Richard was given a First Edition of the Graham Greene novel, which interestingly, was written after the film. We then travelled from the Ferris wheel to the Clubhouse and BBQ by the park miniature train!! During the weekend, everyone enjoyed the sights of Vienna, and most of the party had either arrived earlier or departed later to take in extra sight seeing. Thursday night, on arrival, the LX group enjoyed a delicious Vienna Schnitzel dinner, and on Friday had a memorable boiled beef dinner at the nearby Plachutta restaurant a secure environment as that night the Greek President and his entourage were also eating there! Thanks to Richard for organising these dinners, the Ferris Wheel and generally the Tour, to Robin Mayes for booking our excellent small but central hotel, to Lesley Martin for the boat trip, to Tony Jones for behaving and to all the party for helping out and being such great company. A wonderful LX weekend abroad, playing new teams and in unchartered territories!